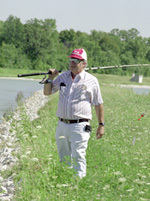 Duane Plant uses a fishing pole with an attached thermometer to test water temperature at the Main Injector Pond. Duane Plant, a member of the Fermilab community for 34 years, will retire today. Described as an "inventive, creative scientist" by his co-workers, Plant is known for his work with tiny cameras and his ability to foresee problems before they occur. Plant's resourceful skills recently earned him the title of "MacGyver" in an April symmetry magazine article. Prior to joining Fermilab, Plant worked for the U.S. Defense Department on electronic countermeasures such as radar disruption. He first visited the site with a friend in 1973 and was extremely impressed by the accelerator's main control room. He applied for a position in the Accelerator Division and began work in June of that year. While at Fermilab, Plant has worked as operator (Levels 1 and 2), crew chief, and machine specialist. He served a brief stint with Superconducting Super Collider as collider operations engineering physicist from '91-'95, and from '95-'97 he assisted with the assembly of the main injector. Since then, Plant has worked under Paul Czarapata in the Accelerator Division as a senior operations specialist. "I'm basically a machine trouble-shooter," he said. Plant has always been fascinated by the technology at Fermilab and cites the diversity of work as his favorite part of the job. "There's always something interesting to work on," he said. Aside from his work, Plant will also miss the camaraderie between co-workers. "They're a great group," he said. He plans to spend his retirement fishing and camping. BATAVIA, ILLINOIS--In particle physics, the quintessential big science, $30,000 usually doesn't buy you much. For example, the mammoth Large Hadron Collider (LHC) under construction at the European particle physics laboratory, CERN, near Geneva, Switzerland, costs a staggering $3.8 billion, and each of the atom smasher's 1232 main steering magnets costs 1 million Swiss francs ($800,000). But for less than 0.001% of the cost of the LHC, a tiny team here at Fermi National Accelerator Laboratory (Fermilab) hopes to pull off an experiment that could clinch a discovery as revolutionary as any the LHC might make. BATAVIA - The emerald ash borer has hit Fermilab. Illinois Department of Agriculture officials last week found three ash trees infested with the emerald ash borer. The trees are on Fermilab's property along Kirk Road, just south of Wilson Street. U.S. Department of Agriculture officials will meet with Fermilab leaders today to talk about how to deal with an emerald ash borer infestation. The international community aims to select two detector concepts by the end of 2008. The cacophonous tune of cicadas serenaded the physicists at last week's Department of Energy and National Science Foundation review of the US Detector R&D Programme for the International Linear Collider. Harry Weerts, the High Energy Physics Director at Argonne National Laboratory, where the review took place, vividly remembered the last time the cicadas visited --17 years ago when another detector milestone was in the making. "I remember it well because we were commissioning the DZero detector at Fermilab," he said. "I'm looking forward to the next time the cicadas come around and seeing what the world looks like then." Envisioning the worldwide ILC detector programme 17 years from now is on many scientists' minds at the moment and one of the reasons for holding such a review. The World Wide Study, the international body that coordinates ILC detector work in all three regions, recently proposed that the International Linear Collider Steering Committee (ILCSC) make a call soon for Letters of Intent to be submitted in a little over a year from now. These Letters of Intent would be backed by design reports to propose candidates for the two detector designs for the ILC. Working within this proposal, the international community aims to select two detector designs by the end of 2008 to support for completed engineering designs by 2010, keeping with the timeline for the accelerator. Window washing at Wilson Hall will continue through today. Wilson Hall's interior will be washed this week. Please avoid walking through or moving barricades. A memorial celebration of the life of Dr. Robert F. Betz and his lasting influence on Fermilab and the region will take place on Saturday, July 7, at 2 p.m. in Ramsey Auditorium. 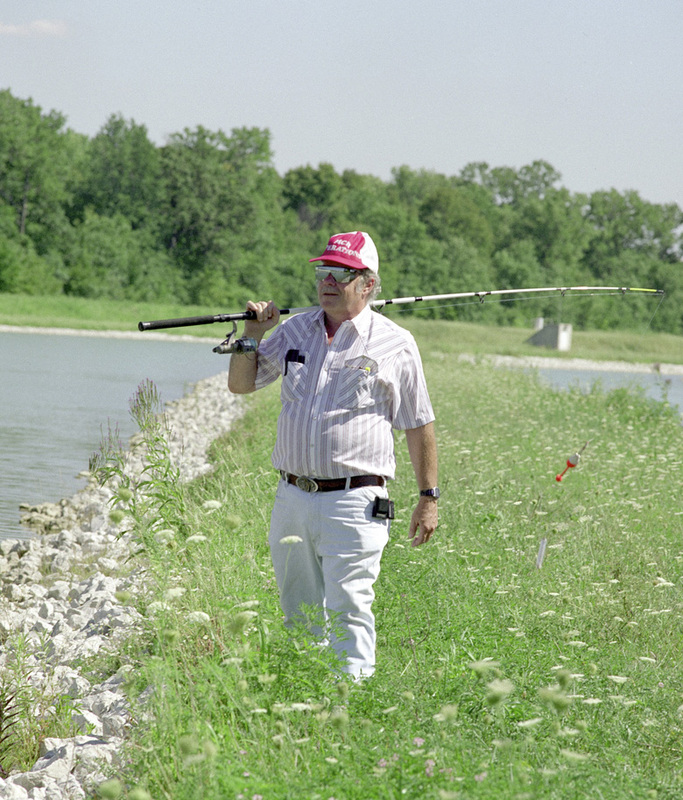 The event will highlight the great contributions that Bob made to prairie conservation and restoration in Illinois, in particular his work at Fermilab and its National Environmental Research Park. Please RSVP to x5422. Click here for more information.